After praying and crying in the car I pull myself together as we pull up to the hospital. And of course my pants are wet because my water just kept on breaking! I felt like a little girl trying to hide what had happened. I am admitted and I have the sweetest nurse ever. I told her how I really didn’t want Pitocin and she said that she will tell the doctor and that she understands because “Pitocin makes things 1000 times worse” (her words!). It was nice to feel validated. I get on the IV and they do what they gotta do. Husband takes a nap in the chair and I start watching TV. and 2 full DVDS of Friends Season 1. That with a couple of walking breaks in-between. I would say it was during the 3rd Friends DVD where the Dr came in and said that she is sitting on her hands trying to not to give me Pitocin. So I decide I am going to make this happen. I literally get on my knees and pray. That is, I climb into the bed and get on my elbows and knees and pray. That is when the contractions really started. Then the nurse came in and we moved the bed to a high level and I leaned over the bed standing. During each contraction Husband drove his knuckles into my back. “I think I want the drugs”. He just looks at me and I’m sure he says something, but I can’t recall. Really it is when you think you can’t take anymore when it is almost over. Lo and Behold it was time to push. But they told me not to because we had to wait for the doctor. That is probably the worst feeling ever. I would say it was 5 or more contractions of wanting to push but being told that I cant. Finally she came, along with 3-4 nurses, and she climbed onto the foot of the bed. I was actually surprised. I thought for sure that she would tell me that I still had ways to go, but nope, the baby was coming. If I wasn’t preoccupied I would have laughed out loud at this. I think it was about 3 pushes and our little baby girl was born. I think: “Just her eyebrows! All that work for just her eyebrows!” I thought for sure she was half way out by now. I ask them “Cant you just pull her out?” They said no. I REFUSED to look or touch…its gross! “ITS OVER” In a relieved sort of way. Like finally this pregnancy is over. The labor is over. The pushing is over. The waiting is over. The first thing Husband says is “Now you can sleep on your belly” LOL. 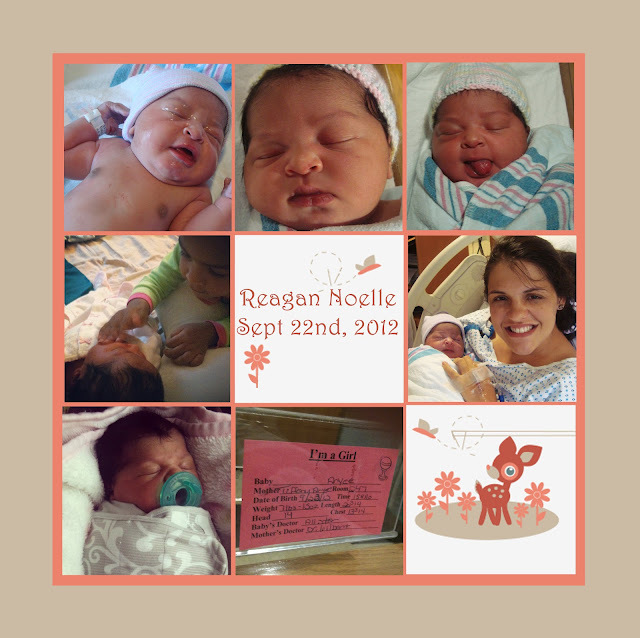 It took us more than 24 hours to name our little girl Reagan Noelle. Awww! She is SO CUTE!